Classical Wu Style Tai Chi "Walk"
3.) That you do NOT lean back when "sitting back" , this is mentioned in the accompanying video. 4.) That you do NOT point the toes of your feet out at an angle when moving forward or back. Notice that Master Hwa's foot has its TOE POINTING DOWN as he lifts the leg USING THE CORE NOT JUST THE LEG MUSCLES. This acts to relax the foot and contributes greatly to the ability of the core to lift the leg. If the toe points up, then chances are you are tightening the muscles of the foot and thus crimping the ability of the core to lift. Think of the concept this way: Make as tight a fist as you "white knuckle" can and try to move your arm, the same "crimping" of energy occurs when you tighten the foot. The same holds true for kicking as walking, the more you relax the toe, the more the heel can extend. Master Hwa: I am very surprised at the response to the Youtube videos I have of "walking". Most people seem to respond to them. So the walking does strike a chord when people see it. Also, a lot of sites link to the walking. They really can see the value of it. It really is such a foundation for the Tai Chi. It provides so many benefits. The Wuji Form and application of Zhan Zhuang will now be presented. Authored by J.B. Milne and Stephen Hwa, Ph.D. Breathing will be done naturally. 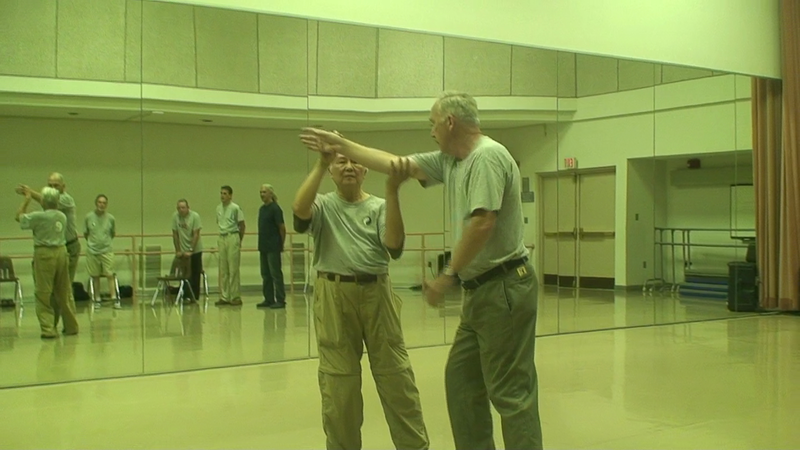 Zhan Zhuang for Taijiquan Practice. The Wuji Positions allows the practitioner to relax the mind, while, adjusting, aligning, and balancing the body to produce correct postures. Zhan Zhuang Training, on the other hand, strengthens the tendons and ligaments, aids in balancing, teaches the muscles to relax, and identifies weaknesses not noticed while practicing the Form. This is important in helping to identify the proper placement of the heel and weighting of the empty foot. 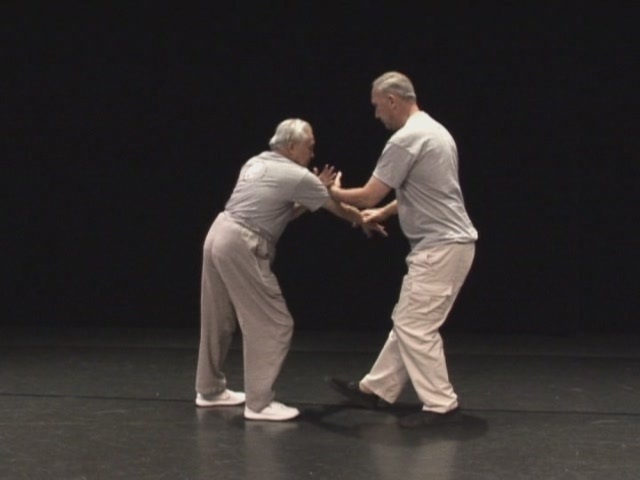 The Square Form of Classical Taijiquan, brush knee movement (on both right and left sides) is being used to illustrate how Wuji and Zhan Zhuang can be applied at those stopping points for each position. Applying these training methods in addition to form practice will help the student in developing strength and proper form. Wuji is defined as nothingness, the beginning before intention and movement. 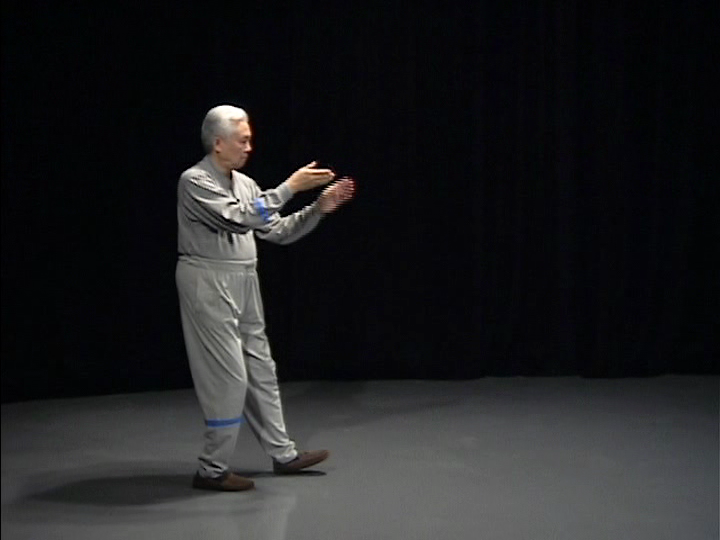 Wuji is discussed in many Taijiquan Books written by both practitioners and masters alike. These writers mainly address Wuji in the Preparation Posture and/or the Closing Posture of the Taiji Form. As such, most readers are left to believe Wuji is only accomplished at the beginning and ending of the Taiji Form. However, this is not so. Wuji is practiced during every posture, that is, every posture begins with Wuji, moves into Taiji, and returns to Wuji. Zhan Zhuang (standing like a stake, standing like a tree) Training is a way to relax both the nervous and muscular systems simultaneously. This is accomplished by combining exertion and relaxation simultaneously. Breathing is done by inhaling and exhaling gently through the nose while keeping the mouth closed and relaxed. The chest, stomach, and hips are in a relaxed state. Zhan Zhuang helps with the identification of the energy flow in the different positions and trains to keep the localized nerve activity dormant (Forum 6); as well as, strengthening the yin side of the posture for strong rooting and building power (Forum 7). There is no set time limit in Zhan Zhuang Training; however, the seasoned practitioner has been known to hold the positions in excess of twenty minutes. Some have claimed to be able to hold the positions for hours. It is important to remember, that as the tension builds in different parts of the body, to tell yourself to relax. (RELAX, RELAX, RELAX) Start with short time frames and increase the holding time slowly. 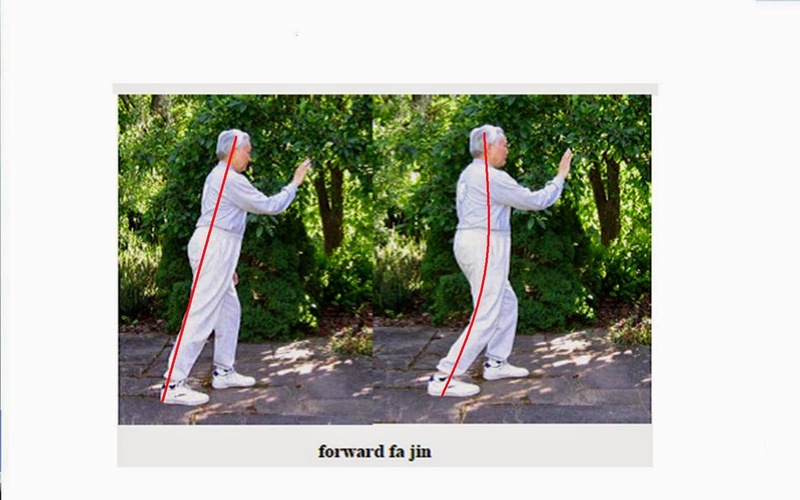 Wuji movie "Left side "
Wuji audio instructions "Right side"
Wuji audio instruction "Left side"
The right foot is flat on the ground supporting the body weight completely with the right knee bent slightly. The left leg is straight without any pressure on the knee or left heel, left toes are extended as high as they will go, giving a slight stretch to the back of the leg. The tailbone is tucked in and the head is stretched up by the neck muscles. The shoulders are relaxed and the elbows are pointing down. The palms are facing each other at shoulder width, with the right fingers pointing to the front and the left fingers pointing up. Notice that a straight line could be drawn between the crown of the head, passing through the ear and knee to the right foot. In transition one, the only change to the beginning position is the left arm is held across the body with the palm facing down. In transition two, the only change to transition one is the left toes are touching the ground. All the weight is still maintained on the right foot. In the end posture of Brush Knee Push Step, both feet are flat on the ground with the left leg supporting the body. The right leg is straight with a stretch between the Achilles Heel and the back of the neck. The right palm has rotated to face front, thumb in line with the nose, and the left palm has moved across the left thigh. Notice that a straight line could be drawn between the crown of the head, passing through the ear and knee to the left foot, as well as, between the right ear, right shoulder, and right knee to the right foot. retreating, the distance seems exasperatingly short." This variation of "hand strums the lute" occurs in the Classical Wu Style Tai Chi form a number of times (3) that precede and intersperse the repetitious movement in Parting the Wild Horse’s Mane 野馬分鬃. The internal discipline of the movement itself comes from the core with the arms being largely immobile. The lifting of the opponent comes from what might be called a lifting movement of the core at the waist. An analogy might be described as opening the lid of a trunk with all the energy at the hinge. The body "opens" from a low to a high position wherein the student is inclining slightly back. One sees this type of vertical core movement "opening" in the "preparation" movement, the first movement of the form albeit without inclining. Master Hwa: "In the Jou Tsung Hwa's gathering I picked a guy to come at me. He came at me, I sat back and threw him. Everybody (laughter) and I picked a big guy, so he came at me. So you see, let me do it slowly like in the form. It is really this move that is before "parting". This is a movement to handle people who come over the top at you and you do this. Student: (laughter) that was hard for me to either lower myself or fall over. Master Hwa; You notice when a bigger person comes at me, I do not raise my hands. My hands are still down here, I just lean the body back. With my arms down here they are very strong, if I raise them then I cannot lift him. Student: All I felt was the integrity of your form, I did not feel any pressure. Master Hwa: Right. 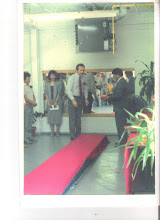 When I did it at the Jou Tsung Hwa festival, a guy that I threw, said "you do it very smoothly". You do not feel any kind of forced movement. Very natural, I think. This is why we never lift our hand over our head in the form or otherwise. If someone comes over the top I do this. This looks like the hand is over the head but it is not. In "Pivot", (Qi Journal, Autumn 2002) Y.L. 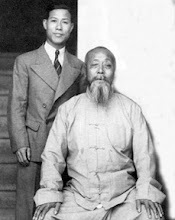 Yip and Leroy Clark stated that Wu's Tai Chi was called "The Solar Plexus School" . "Pivot" was a lengthy article in Qi Journal about the 1950's fight between Wu Kung-i and Ch'en K'e-fu. In "Uncovering the Treasure", Stephen Hwa quotes Jou, Tsung Hwa. From: "The Tao of Tai Chi Chuan, The Second Stage". "The hallmark of the second stage is the use of the torso method. Torso method is characterized by use of the body, specifically the waist and spine, to initiate and empower the movements of the arms and legs...Only those who reach this stage can truly be said to be practicing Tai Chi, yet these are few indeed." Master Hwa: Yesterday we talked about how to get out of the "grabbing". Now in that case you do talk about moves. This is so important because people will grab you. There are quite a number of moves in the form where one can learn to get out of the grabbing. For example, this one where you punch, people grab you, you turn the arm to release the grab. The other hand slides up the arm like this to get their hand off you. Even this move right before diagonal brush knee, where you rotate the arm to get out of a grab could be useful. When you turn the arm in this manner as people grab you, you are turning on this axis. Turning on that axis, you have an advantage in leverage. This is because you are turning on this very short axis. So, even against a more powerful hand you can still turn. Then you get to the point where it opens and you can get out of the grab. Then you remember I talked about the rotation of the arm in other moves and you can get out of a grab there as well, this is so important. You know, you will encounter grabbing, and you need to counter it and you need to do it fast. You need to do it fast but properly before someone gets a solid grip on you. In order to get out of it you want to do something immediately. Student: "I thought I saw you press a point on his hand on your DVD"
Master Hwa: Right, right, but that is kind of like this which comes from the move in the form when he grabs you. I press a little bit and then I am turning my arm to release it. Well, we practiced that with Pete who is a wrestler and he has a very strong grip. That is how we develop and put it to good use. I find this with my nephew who is 22 years old, 6'4", a wrestler and very strong. So he wants to get hold of my hand so he can get me on the ground. So practicing with him, he just cannot get hold of my hand. So you know lots of people in martial arts also come from the weight lifting room. They are very strong and they want to grab you. Actually, he is my grand-nephew. Student: "How does Tai Chi do against Brazilian Jiu Jitsu?" Master Hwa: You know...this is all individual. It is individual because when we practice the form we can reach a certain stage where this is called "mastery". In other words, with such "mastery", you can do the form, where every move is internal. You can do the movements and you don't have to think. So, at that stage, you have "mastery" of the form. But with martial arts applications there really is no such "mastery". I mean to say that it is endless. Martial art applications are endless. So it is hard to compare when it is so together. Except at a time when the first Tai Chi master went to Beijing. He went to Beijing and he liked to challenge people. It is said that he beat up everybody. He even makes insistence that other masters fight with him so he can prove it. He just wanted to try it out on other martial arts. So in that sense, and at that time, he did win. The other thing to consider at that time is that people did not know about Tai Chi. 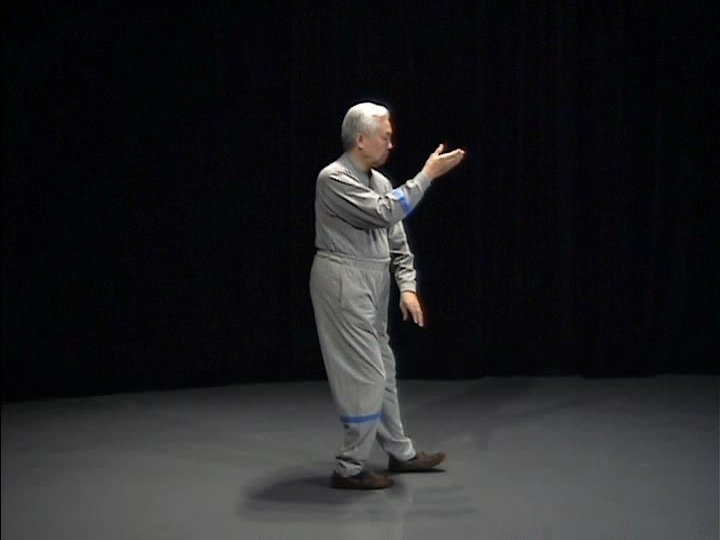 You see that is another thing, people may not have developed a way to counteract the Tai Chi. Now if you know Tai Chi like in the fight between Wu Gong Yee and the other guy (White Crane's Chan Hak Fu). Now, both sides know each other's art very well. So, I'm sure they developed a strategy to counteract the opponent's strength. Now the other guy, if you watch the video, and you Jim, you watch it many times. Student: "Yes, that is right". So the guy changed the way of his external martial art. He did not use momentum, he did not use body momentum at all. 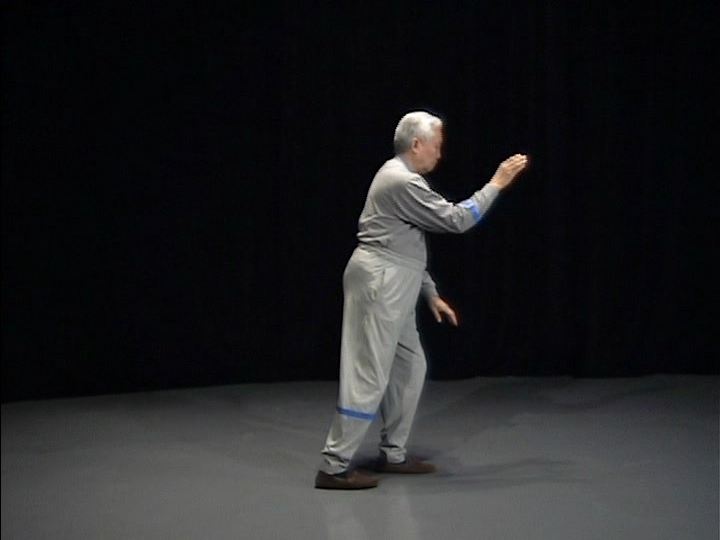 He knew if he used body momentum, the Tai Chi was very good at counteracting body momentum. So you see when you watch the video, he is just chopping with his arms, there is no body momentum, isn't that right? So there is just flurry of arms without any body momentm, keeping the body momentum to a minimum or none at all. Certainly in that way he cannot develop all the power and so forth. So at least he tried to avoid being put on the ground by Wu Gong Yee. So you hear many people nowdays they don't think Wu is using Tai Chi or that the fight was bad, or they don't know what they are doing. So you cannot blame him, for in that case, he cannot be using Tai Chi. Once again you see the guy is not using body momentum so how should Wu use Tai Chi, OK? 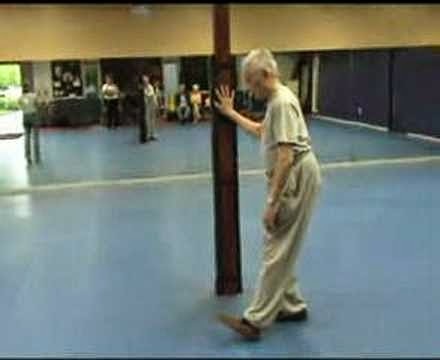 People watch that tape, and they say, how come, and Wu should have used Tai Chi. So there is no momentum on the part of the guy, just flurry of arms and so with every chop Wu has to block. So also notice Wu is using the edge of his hand to block. He is hitting the guy on his inside forearms and after awhile the guys arms get tired...his arms are being hit on inside forearm muscle right there. Note: Little known details after the fight as revealed in the "Pivot" article show some interesting things. Chan Hak Fu had actual arm injury which he showed the artist Lo Pak. He had multiple bruises. Chan told him: "Don't think that I can not beat an old man but this Mr. Wu is a different matter and not such a simple matter". "His light chops like a "baby's fist" caused all these bruises". Wu Gong Yee on the other hand was to show his disciples his dentures and say: "I wore these dentures into the ring, had I been hit, the dentures would have fallen out". Wu was asked what he used and he said "ban lan chui" (deflect, parry and punch) which has many variations, but everything depends on how the opponent is moving in determining how you should move". It has been explained in "pivot" that in later interview Chan Hak Fu stated the newspapers of the time wrote such controversy that stirred the fires for the fight in the first place. As Master Hwa states and shows, the fight probably looks very dry to the lay person. We are raised on a diet of the spectacular in movies and TV so that fight looked "unappetizing". As Master Hwa shows with his own chops, the two palms of Wu would go from out to in, from low to upward to intercept Chan Hak Fu's fists. It is also interesting that people find the fight boring in light of today's movies and TV. Students of the time reported being terrified at the sounds of the fight. One could hear the cracking sound of the hits. People passed out in the audience, blood was flowing so much from Chan Hak Fu's nose that it could not be stopped. For those that doubt the efficacy of Tai Chi or the "boring" fight, it would seem that it still and perhaps even moreso bears out the adage "there are no winning moves, there are only winning executions of those moves".